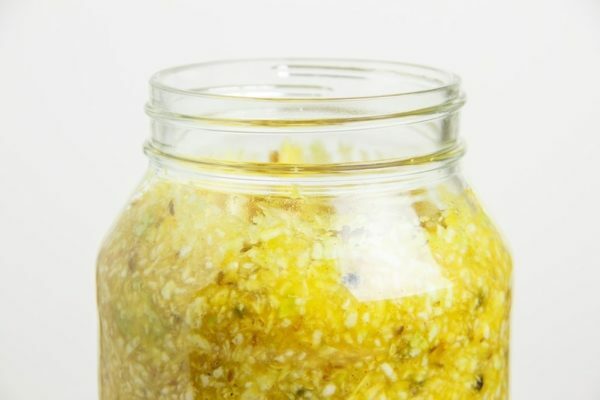 Sauerkraut – ‘Sour Cabbage’ – is a gut-loving superfood. Sugars and starches in the cabbage (or other vegetables) are converted into lactic acid by bacteria during the fermentation process. What results, is a proliferation of lactobacillus acidophilus that are extremely beneficial to our digestive systems. If you haven’t yet come across a book called ‘Nourishing Traditions’ by Sally Fallon, I highly recommend it. It is not plant-based cook book – it is however, a selection of recipes that heralds back to the culinary customs of ancesteral times. Whole foods prepared in traditional methods. She has an entire chapter devoted to fermented vegetables and fruits from which I based this particular sauerkraut recipe on. I think she is the Queen of Fermentation! Traditionally, fermented foods were eaten at the end of a meal to help it digest properly. Korean Kimchi for example – made with a mixture of vegetables and fermented for weeks at a time with a variety of spices, is eaten daily, usually at every meal. Store in the fridge once the desired flavour has been reached, to slow fermentation. The addition of salt creates a brine which helps the vegetables to sour and ferment without rotting. 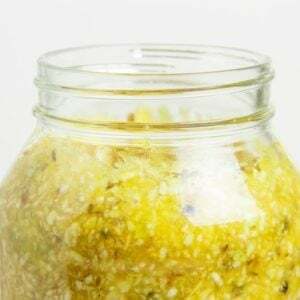 Classic sauerkraut spices are juniper berries, caraway seeds, dill and celery seeds. I decided to use a mixture of my favourite spices in the spice cabinet, so used whole black peppercorns, fennel seeds, paprika, turmeric and coriander – I’m expecting a bit of an Indian spice kick to it in a few weeks’ time! 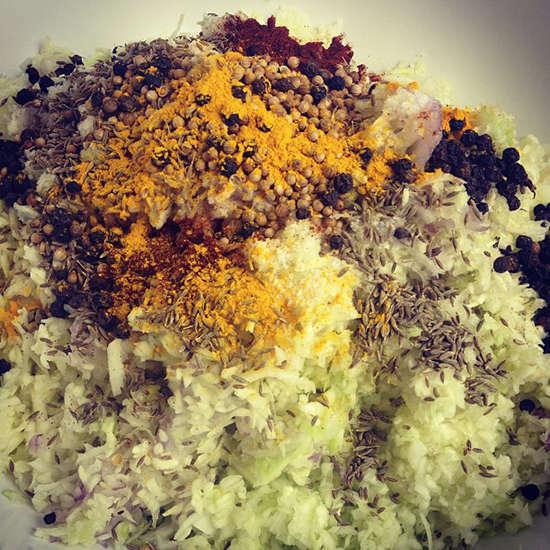 Energetically, and according to Ayurvedic tradition, cabbage is a calming, warming, grounding food. It strengthens the stomach and moistens the intestines, helping to treat constipation. Often called the poor man’s medicine – cabbage is said to be an extremely effective remedy for stomach ulcers. Cucumbers, daikon, radish, beets, turnips, onions, cabbage, eggplant, squash, carrot. Wash then finely shred (by hand, or in a food processor) the cabbage and onion. In a large bowl, combine the vegetables with the salt and spices. Pound them with a wooden spoon to release all the juices. Transfer to a steralised 2 litre glass jar, use your fist to firmly pack it down tight as you go. You should be pressing so firm that the brine is released and covers the vegetables. Leave a one inch gap at the top, as the vegetables will expand as they ferment. Seal and leave at room temperature for at least three days to get the initial fermentation process started (do not disturb it or open the lid during this time). After that, the longer you leave it, the better and more mature the flavour - try fermenting for 2 to 3 weeks, tasting at regular intervals.